Searching for fonts that look like Wynwood JNL? Look no further! 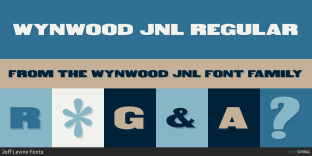 Here you will find fonts that look like Wynwood JNL. Worry-Free! Nulshock Typodermic Fonts Inc.
Worry-Free! Battlemaze Typodermic Fonts Inc.
Worry-Free! Recharge Typodermic Fonts Inc.
Worry-Free! Engravers Gothic FS FontSite Inc.
Worry-Free! Korataki Typodermic Fonts Inc.
Worry-Free! Quadrangle Typodermic Fonts Inc.